Businesses looking for simple, professional, cost-effective and environmentally-friendly methods to extend holiday greetings to their customers and clients use corporate holiday ecards. Encore Ecards will provide a do-it-yourself solution that is easy-to-use, flexible and offers a premium collection of corporate e-cards. Encore Ecards is being developed for small businesses, organizations and professionals who typically send greetings to 500 or less recipients. Encore Ecards will also provide options for groups sending to 500+ recipients. While we await the launch of Encore Ecards, here are some of our partner sites offering premium corporate ecard products. View corporate e-cards available from Progressive Media Group Inc.
Visit Progressive Media Group Inc.
View business holiday ecards available from BusinessHolidayEcards.com. At Encore Ecards, you'll see a collection of premium quality and professionally designed ecards. Our designs could be characterized in many ways, some include highly detailed, sophisticated, professional, cool, and sleek. Also, our key ingredient that brings everything together is some good old tender loving care! The collage below shows the look and feel of some of the ecards you'll see here. As we get closer to launch, we'll post a sneak preview with live samples. Here's a look at just some of the features Encore Ecards will offer. and more...we're keeping the rest a surprise! 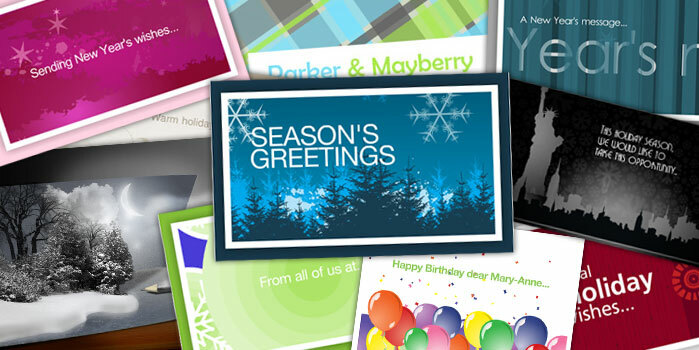 Many people wrongly assume that sending out company holiday e-cards is just for show. However, that is not the case. Extremely few companies capitalize on the full potential that these e-cards possess. Corporate Christmas or holiday e-cards can serve as great marketing tools provided you design them in the best manner and then take care of their proper distribution so that they retain their high quality and display a great style. It is definitely true that business holiday cards still remain a great untapped resource when it comes to name recognition, public relations, and branding. The resource is not even that expensive to send out, and your company can remain in the minds of so many stakeholders this way. The only thing that you need to make sure is that you make a new card to send out every time you are thinking out something to send out to your stakeholders so that the effort does not get outdated. While it is true that there is a lot of potential in these e-cards, it is also true that their preparation and sending needs to be properly executed so that warm relationships can be maintained with all the company stakeholders. You can be as festive and creative with your cards as you possibly can. All you have to do is make a classic statement. You can leave a greater impact on your stakeholders if you personalize the cards according to each of the stakeholders that you send them to. While this may take a considerable amount of time to achieve, the task will definitely be worth it in the end. You can do this by addressing the individual personally and writing something in the card that will reflect their very personality. When it comes to choosing the best e-card to send on behalf of your business, you need to consider how formal or informal your business is with the clients, and how best you can carry the brand image forward. Corporate e-cards do not necessarily have to be for your clients only. They can be sent to your employees as well to let them know how much the company appreciates all their hard work. This way, the employees can remain motivated and work to achieve all of their goals in a timely manner. No matter what style you select for your corporate e-cards, be sure that you are representing your business in the best light possible. While e-cards serve to send some message or holiday cheers across to all the stakeholders, they are also important for brand recognition and recall, and ensure that you remain in the minds of all your clients, employees, and other stakeholders for a long time. So, why not capitalize on corporate e-cards this year and make the most of your marketing efforts. The best part is that designing and sending these cards out does not take a lot of time and money; and with such an effort, you can reap many benefits.